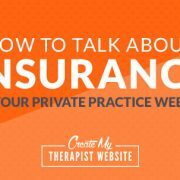 Today we’re going to talk about how to use Pinterest to market your therapy practice. What did I ever do before Pinterest? How would I have known I could build so many things out of pallets? Or cook such amazing (and simple) dinners while my wife (the therapist) is seeing clients well into the evening hours? Aside from recipes and craft ideas, there is wealth of information on Pinterest. And the potential to use it to drive traffic to your website is HUGE. Clearly, Pinterest is where a LOT of people are spending time online, so your potential audience is huge. Another benefit is discoverability. When you tweet a link or post it on Facebook, it tends to get lost. Burried in the social media shuffle. What I like about Pinterest is that the shelf life of your pins is potentially endless. If you create engaging pins with descriptions that help people find them, it means at any time in the future, your content can be found and traffic driven to your website. What’s great too is that Pinterest is a place where people go to research topics and get help. And because you’re a therapist, I’m guessing your pretty keen on helping people. Writing informative blog posts and promoting them on Pinterest means you can help a lot of people, and not just those you see in your office. And boosting the traffic to your site will mean the people who are local to you can find you more easily in Google and get them in your office. SEO win! Another pretty cool aspect of Pinterest is that it makes your entire audience your potential marketing team. If you’re creating killer looking pins and have the content on your blog to back it up, others will repin it. And as more people see it. More can repin it, and the cycle goes on and on. Ok, so let’s get into the actionable stuff. 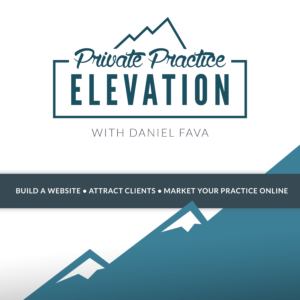 Below, I’ve laid out some of the steps you can take to get your Pinterest profile working more for you and driving traffic to your private practice website/blog. To help you run through it, I’ve created a handy checklist you can reference. 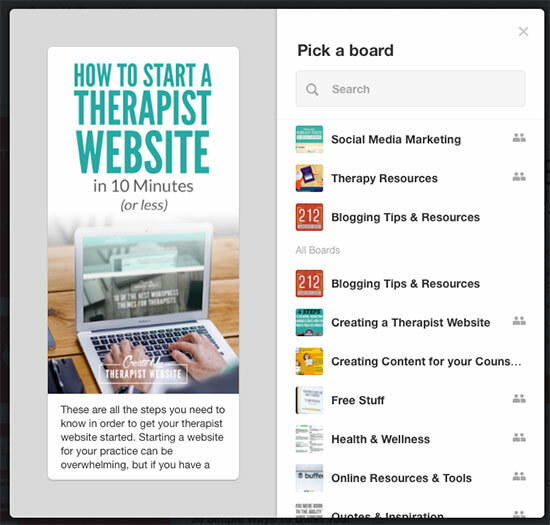 To make the most out of using Pinterest to drive traffic to your therapy website, you’re going to want to make sure you’re using a Pinterest business account. There are some awesome benefits to creating a Pinterest business account. One of the best reasons is that you’ll get to use Pinterst Analytics. This will help you learn which pins are getting the most repins and clicks as well as track the performance of your profile and website content. A business account will also give you access to rich pins, which we’ll discuss more in depth below. I should mention that all these benefits are FREE. BONUS! 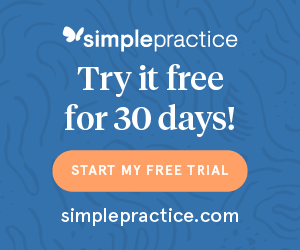 Now, if you already have a personal Pinterest account that you’ve been growing in followers for a time, don’t worry, you don’t need to create a new account (unless of course you want a totally separate account for your private practice). With just a couple clicks you can convert it to a business account. 1. 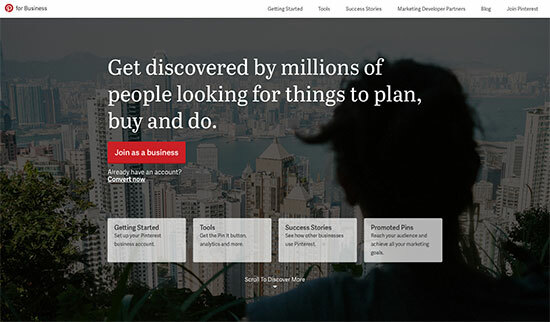 Go to the Pinterest for Business homepage and get started. If you want to start a new account just for your private practice, you’ll click on the “Join as a business” button. 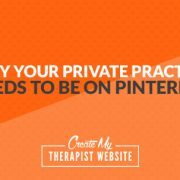 Already have a Pinterest account you’ve been using that you’d like to continue using for your private practice? Follow these steps to convert to a business account. In order for Pintersdt to start providing analytics, you’ll need to confirm your website. Pinterest provides instructions for two ways of doing it here. The way you choose to do it really involves what you’re comfortable with as far as making edits to your code. I recommend the second method shown and using your host account’s file manager to upload the Pinterest file to root directory of your website. You’re all set! Give it a day or so and you’ll start seeing some numbers in the Analytics section, which you can find in the top navigation next to the Pinterest logo. You can see the extra info that Pinterest provides to users when they see this pin. It let’s people know the name of my site as well as the title of the blog post in nice large text. It also provides a link underneath to my Pinterest profile so people can easily follow me there. Rich pins can have a huge impact on the amount of repins and views your profile receives. We like that! So how does one set Rich Pins? Just follow the steps below. 1. 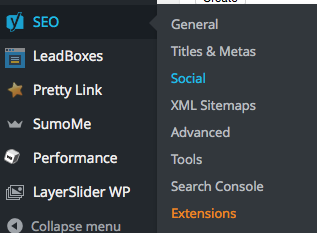 If you haven’t already been using the Yoast SEO plugin (I HIGHLY recommend this plugin) go ahead and install it. Then Go to SEO > Social > Facebook, and check the box that says “Enable Open Graph meta data”. 3. 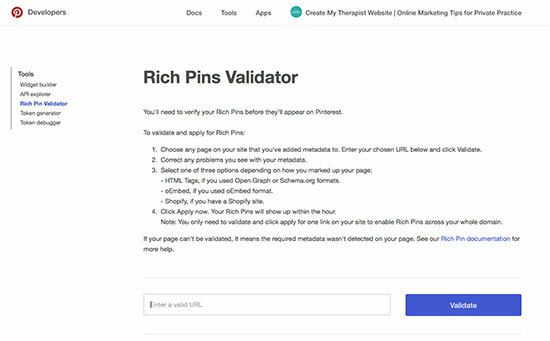 Once it’s done, you’ll get a message saying your pin has been validated along with the info that Pinterest is seeing for your blog post. I’ve found that the best way to drive traffic from Pinterest to my own website is with blog posts. 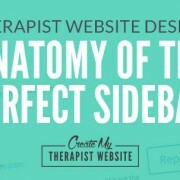 A pin with a single, focused topic that will help people is much more engaging than a generic pin about your therapy website. You can certainly create and promote those too, but blogs are your best bet for a long-term strategy to get people to your website. Step 1 – Write the Best Darn Blog Post You Can, of Course! This should be a given. If your blogs are not providing high value and serving your readers, they will bounce off the site very quickly. Spend some time reading blogs about the art of blogging and creating content that readers will love and want to share. To get you started, I created a board to collect some of my favorite blogging articles and resources. After I write a blog I’ll spend some time brainstorming my titles. I often have a title in mind when I begin a blog, but sometimes by the end of writing the direction of it may have changed. So I’ll take a step back and write out a few, attention-grabbing titles I think would work. I keep in mind that this title will appear both on my blog and on my Pinterest pin, so I want it to be catchy and intriguing enough that someone would want to click and read it. This step is kinda optional. You don’t NEED photos in your pins. You can search for some photos that will work for your pin and blog post topic. I like to have a few to work with. My goal is to create about 5 or 6 pins for each blog post I write. The reason being that different people will see the pins at different times. So I can spread these pins out over time to increase the potential of repins and people clicking over to my blog. I most often use unsplash.com or pexels.com for photos, because it’s free. I’ve also used Shutterstock in the past, which has photos starting at $29 for 2. If you search Google or Pinterest enough, you can find tons of cheap or free options for photos. Now comes the fun part. At least for me. My background is in web design so it’s the visual stuff that I enjoy the most. Personally, I use Photoshop for all my pin designs. Photoshop is the most popular photo-editing and design application out there. I recommend Photoshop, but it is definitely expensive, especially if design is not your main thing. You could do just fine with Photoshop Elements, which is the $99 beginner version, which has much of the functionality you’d use for creating graphics for your blog and pins. There are tons of great tutorials on adobe.com to get your feet wet with Photoshop. I try my best to offer free solutions when I can, and for pin design, Canva is one of them. 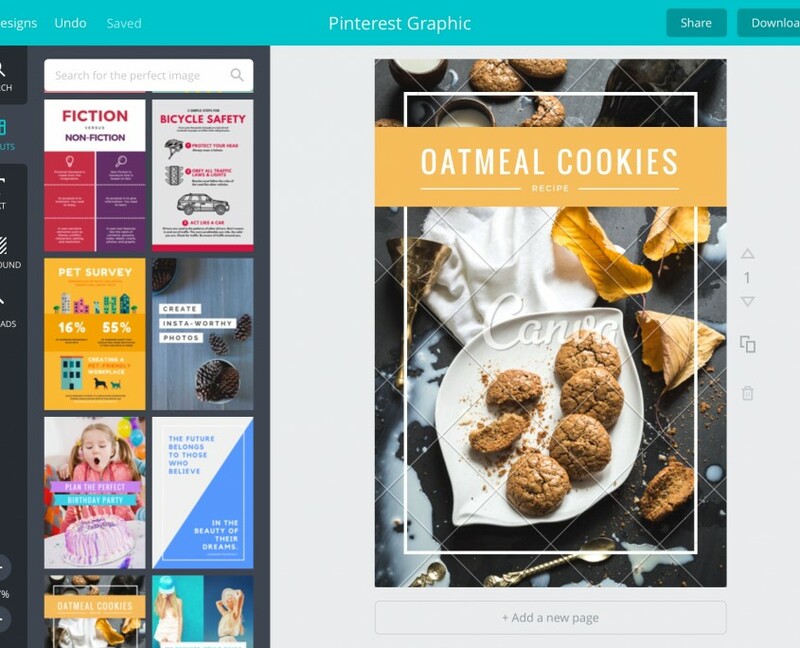 Canva is a relatively new website/app that is really quite awesome. I’d seen the name a lot so I tried it out a few months ago and I love it as a free option for cool graphics. 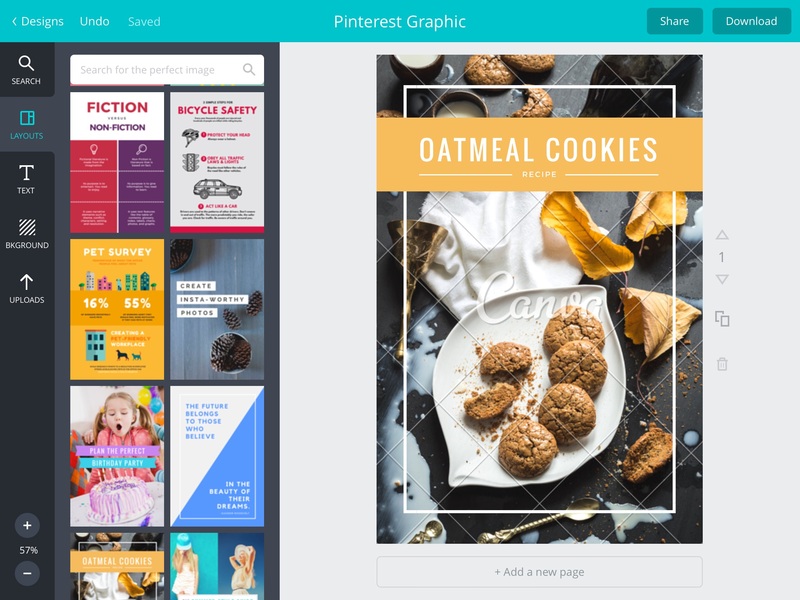 They give you tons of pre-designed templates to choose from, and not just Pinterest pins. You can create Facebook covers, flyers, banners or pretty much anything. You can change the colors and text to your liking and then download your design as an image. And it’s totally free as long as you don’t use any of their premium design elements or stock photos. So check out Canva.com or download the iPad app here. Ok, so we’ve done all this work and we have our beautiful pin designed and saved, so it’s time to launch it into the Pinterest atmosphere and get people coming to our blog. Yahoo! Navigate to your profile page on Pinterest and click on the link that lets you view all your pins. In the top left corner ther will be a big plus sign “+”, click that to add your pin. Choose “Your Device” and navigate to the pin image file that you want to upload. Every Pin should have a description that gives context. The best descriptions are positive, helping people imagine what they might do with the Pin while also providing extra information. Pinterest also recommeds you be very specific and DON’T use hashtags. The overall sentiment on Pinterest is a positive one, so you want to help people. Give them something to do (view your blog) and provide them with great value. 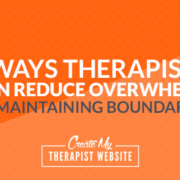 If you have a great post about coping with anxiety, put yourself in the place of someone in the thick of it. What types of things would they want someone to say to them? Be warm and helpful and they will click through to your great content. So your pin is uploaded, description is written. Click on the board that you want it appear in and it will be posted. You can’t add the link to your blog just yet, so you’ll have to view the pin you just created and edit it via the pencil/edit button. Paste the link to your corresponding blog post in the “website” field and click save and you’re DONE! Well, there you have it. To help you run through these steps and get your Pinterest profile working for you, I created a handy checklist you can use for reference, just click here to get your hands on it. I am a horrible writer, so blogging feels very laborious to me. 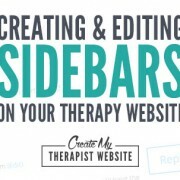 However, I love using Pinterest as a place to store resources for my clients. 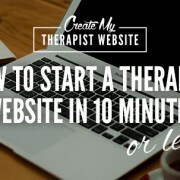 I have a Pinterest page linked from my website where I pin “therapist-approved” articles for my clients featuring answers to commonly asked questions, information about what clients can expect from the therapeutic process, and strategies they can implement at home in between our sessions. Thanks for the input, Laura! That’s a great point. Pinterest can be a great place to share resources with your clients, and not just your own blog posts. 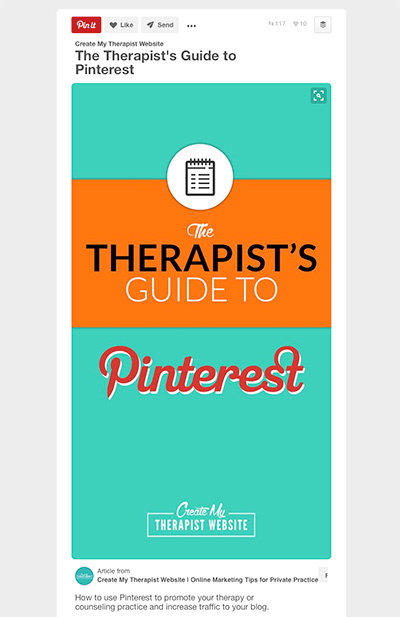 What a great resource this is for helping therapists with Pinterest! Thank you so much!